Summer is ending and fall is just around the corner. It is the time to give your home a fall-ready makeover in this festive season. If you are loving decorating with natural elements for fall like me, you are in the right place. 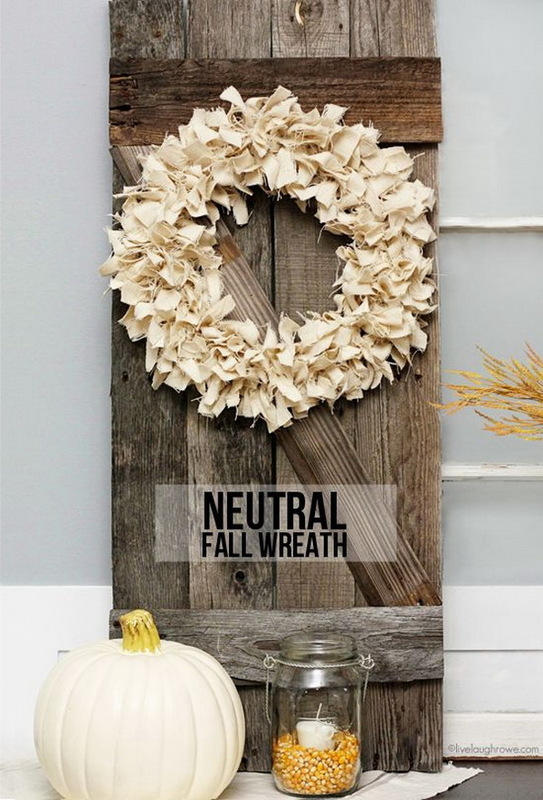 Here we have a great collection of these beautiful rustic decoration ideas for your fall season that you can DIY, which would help show off your personal style and creativity for fall. 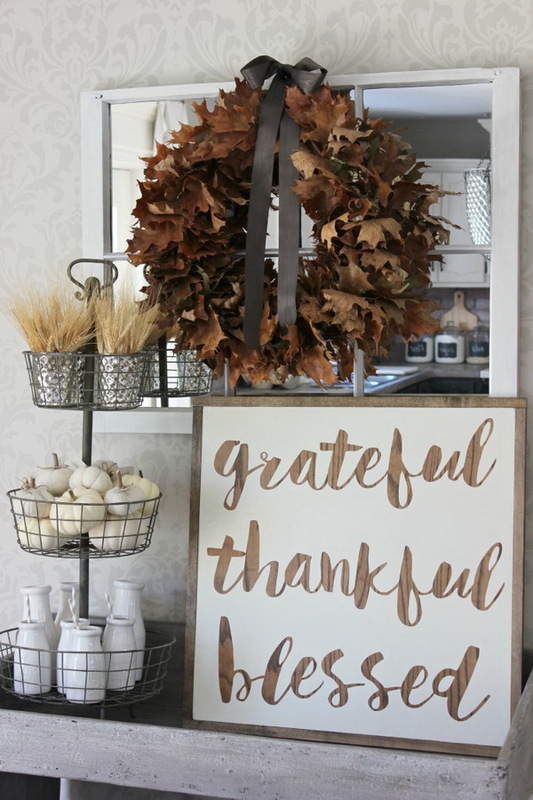 This beautiful rustic thankful sign with natural elements would be perfect in any home or office for the fall decor. Tutorial via hymns and verses. 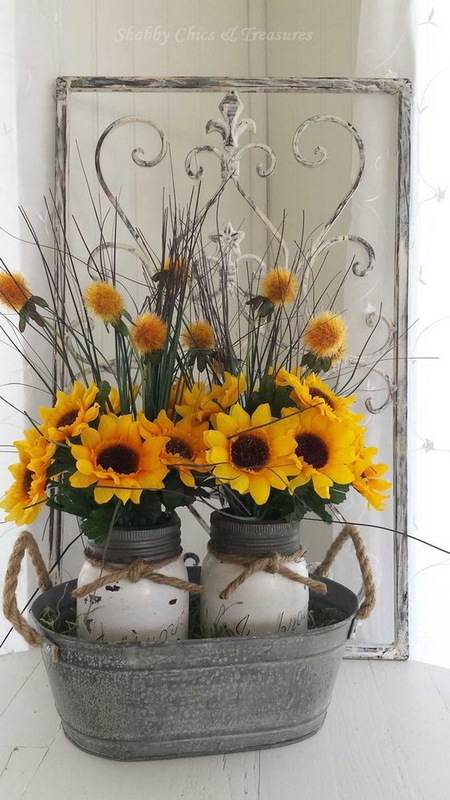 Paint two mason jars in white and lightly distressed and decorated with felt sunflowers with twine tied around the rim of the jar, then put them in a an old bucket. This will be the perfect addition to brighten up your rustic fall decoration for the kitchen counter, kitchen window, entry table or coffee table. Details via 2 decor 8. Repurpose the old toolbox into this amazing rustic centerpiece for your fall mantle or on the kitchen table for Thanksgiving. 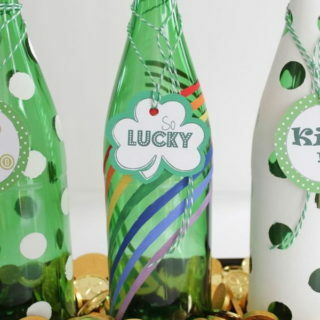 DIY instructions via love create celebrate. 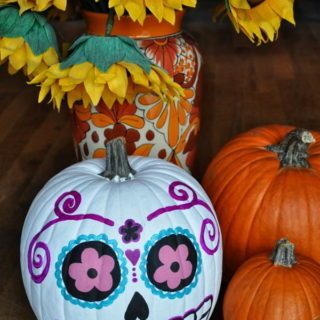 Grab a faux pumpkin from your local dollar store and learn how to turn it into a pretty fall vase like this one. An easy and inexpensive project to create a festive Fall centerpiece that will last throughout the season. DIy tutorial via a pumpkin and a princess. 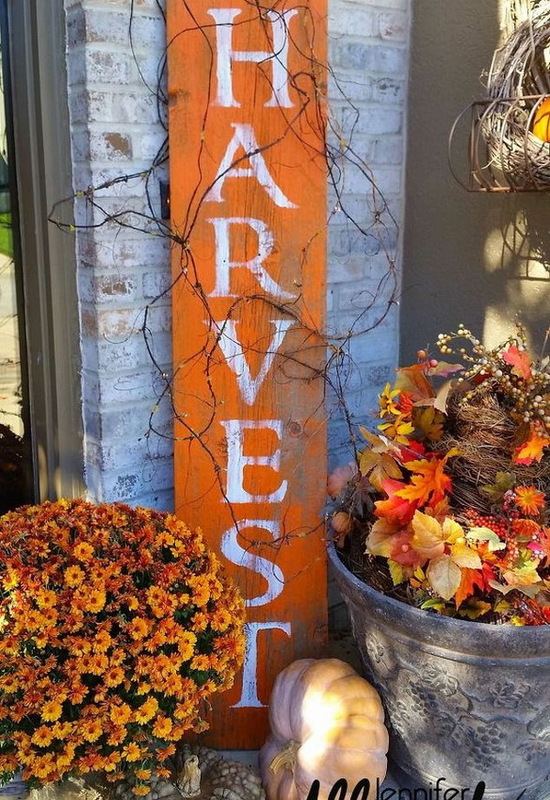 This harvest sign is such a fun, festive and easy burst of fall color fall decor to add to your front porch! See the tutorial via hometalk. 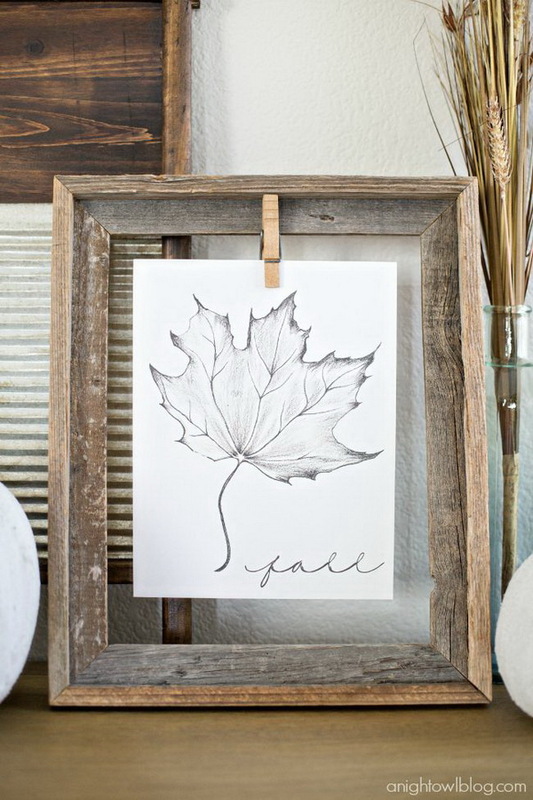 Print out this gorgeous Maple Leaf sketch by Australian artist Raura and display it with an old frame. It will be the perfect addition to your home home this fall season. Get the free printable via a night owl blog. Paint and distress mason jars and filled with whea! 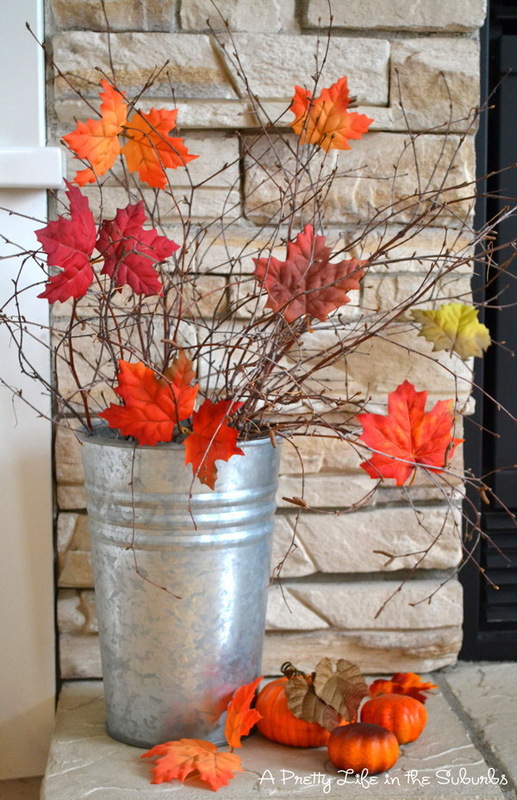 So easy and quick to do and makes a great addition to your fall decoration with rustic flair. Tutorial via sincerely jean. Recycle the old empty frame into this pretty shabby chic decor piece with some chicken wire and natural elements. I really liked the way it turned out. DIY instructions via the painted hinge. Create this easy and lovely rustic fall wreath with a few fun accessories around your house or some findings from the dollar store. DIY instructons via consumer crafts. 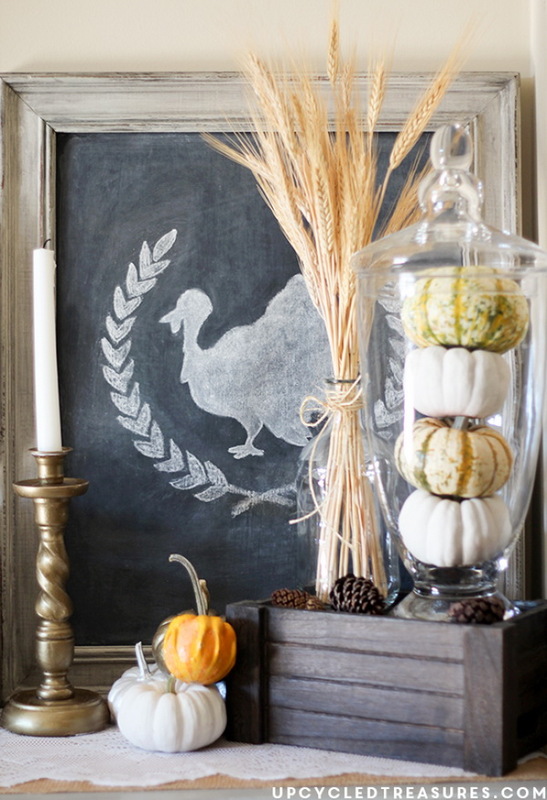 Create this awesome rustic Thanksgiving vignette with some natural elements, like pumpkins, wheat, pine cones and more. Easy and fun to put together for your fall mantle decoration. DIY instructions via mountain modern life. 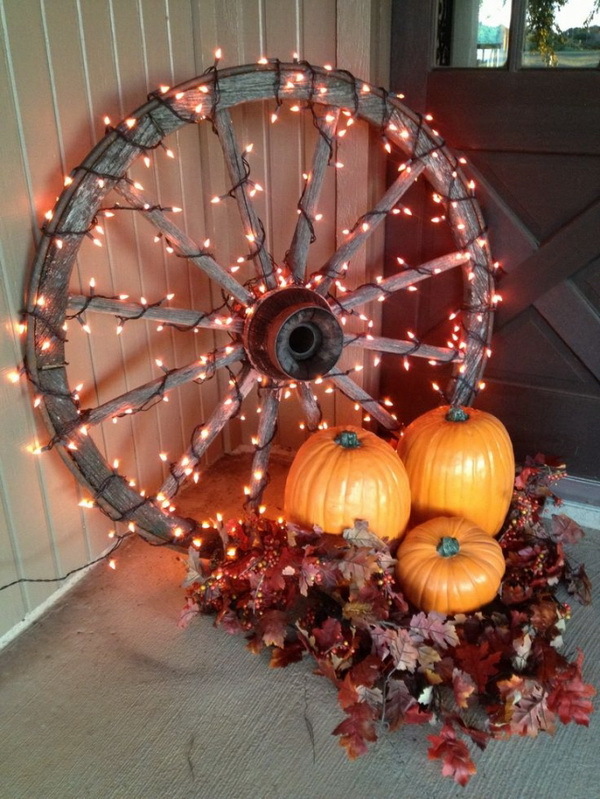 Get the autumn porch decor with pumpkin and lighted wagon wheels. It will be the highlight for a special corner on your front porch and add an interesting centerpiece for the front porch table. Via hngn. Gathering cut birch logs or branches of leaves in a container and creating a rustic palette inspired fall sign to create a beautiful vignette. It will surele add rustic fall decor to your any room this fall season. See the DIY tutorial via design dining and diapers. Welcome the holiday season with an easy-to-make wreath featuring artfully arranged coffee filters. It’s a cheap and easy way to add a beautiful accessory to your decor with this pretty craft. DIY instructions via to simply inspire. 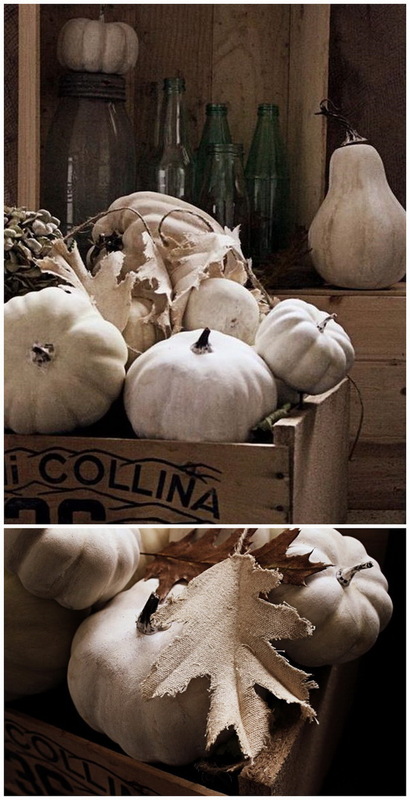 Love this fall decor! 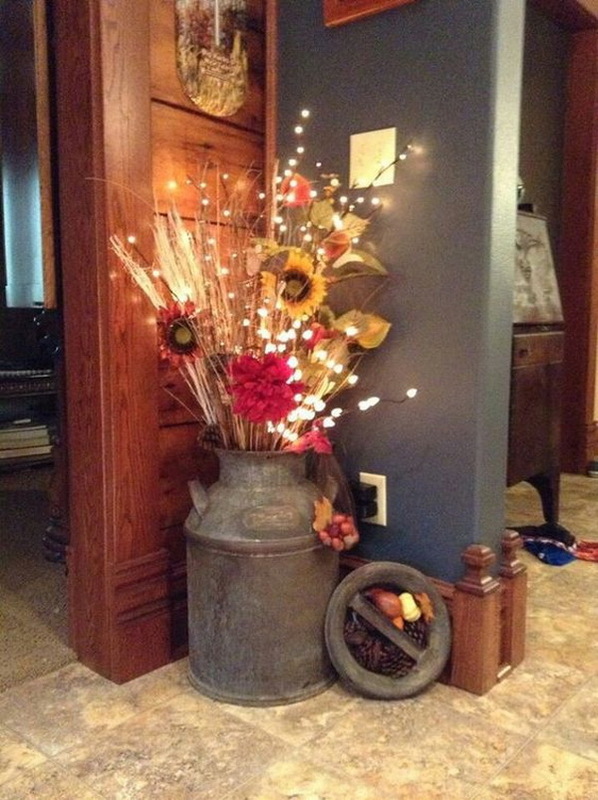 Arrange some fall natural elements, like sunflowers, wheat and branches into an old bucket and add some fairy lights. An perfect addition for your front porch decoration during this fall season. via homedit. 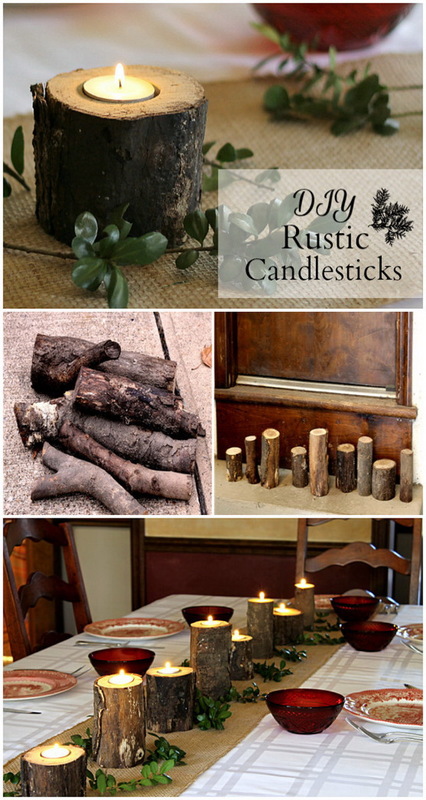 Add the rustic charm and decorative touch to your indoor & outdoor spaces with these DIY log candlesticks. Get the DIY tutorial via garden matter. This wreath is made out of grapevine, and completed with burlap or any other fall ornaments, like pine cones and a chalkboard fall sign. Start to make your own one and complete your home decorations with this elegant and rustic wreath. Tutorial via consumer crafts. This easy DIY Rustic Pumpkin Stand is perfect for the front porch, a fall mantel display when filled with colorful fall decors! DIY instructions via 365ish pins. 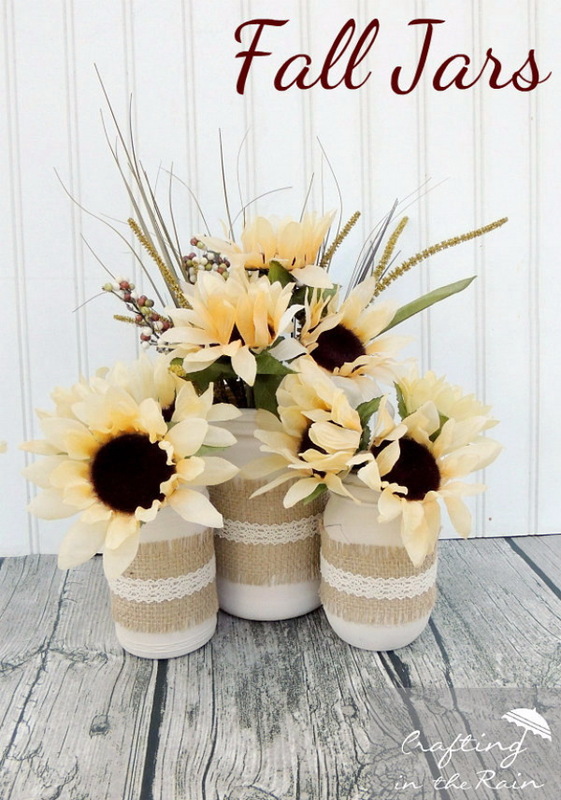 Turn the simple mason jars into these awesome rustic and festive centerpieces for fall season with textures and colors, like burlap, sunflowers,wheat and more. See the instructions via crafting in the rain. 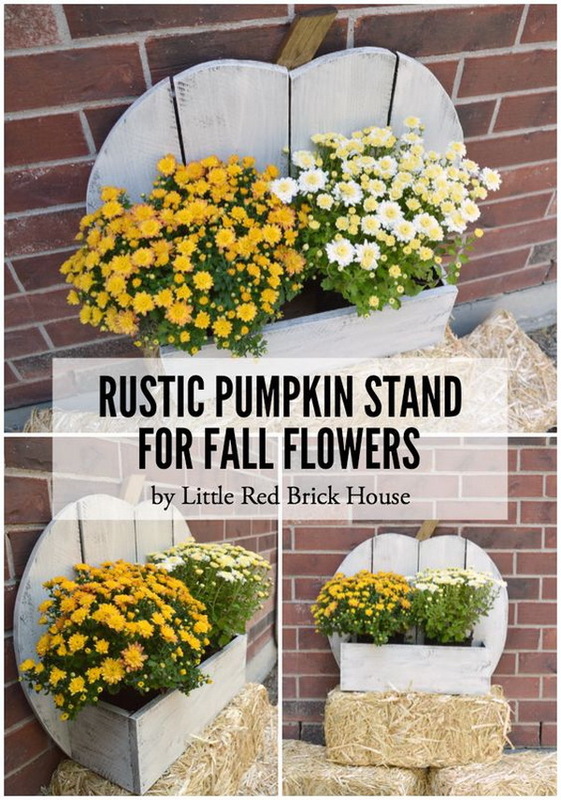 Decorate your front porch with this easy DIY Rustic Pumpkin Stand and fill the box with colorful fall flowers! Tutorial via little red brick house. Get a galvanized metal tray filled with fall textures and colors. This will be the the perfect rustic farmhouse fall centerpiece. Details via worthing court blog. Create a simple but festive arrangement with faux leaves and branches. See the details via a pretty life in the suburbs. 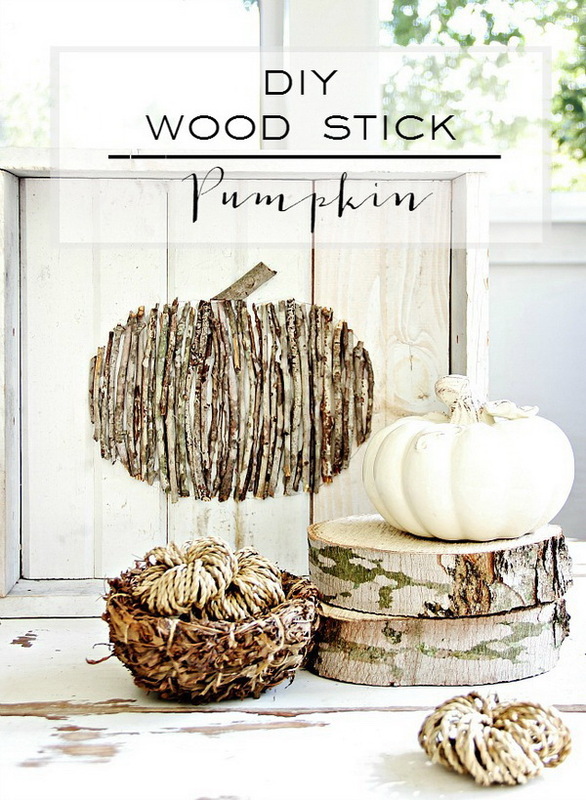 Create this easy, simple fall project just with some sticks from the yard. It only takes you 20 minutes to make! Have a try with this tutorial via thistle wood farms. 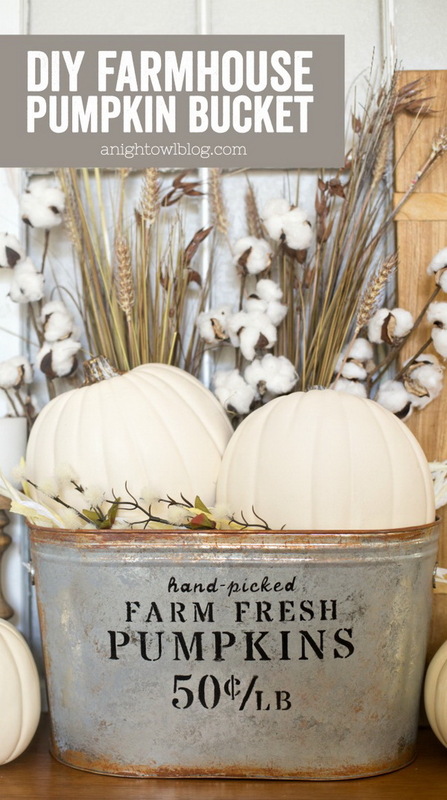 Love the farmhouse look for Fall with this simple but elegant pumpkin bucket. You can make your own one in just a few easy steps! See the instructions via a night owl blog. 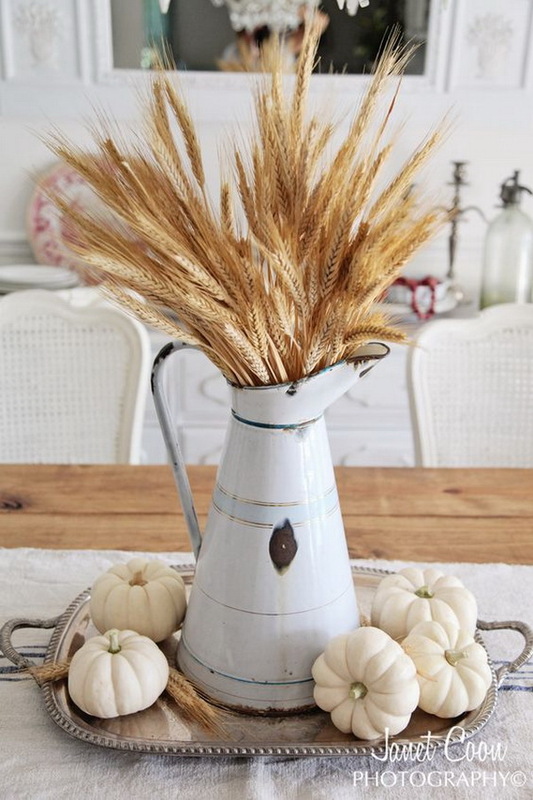 Bring the touches of autumn and a cozy “farmhouse” feel to your home with this easy centerpiece made with wheat and pumpkins. Instructions via home goods. 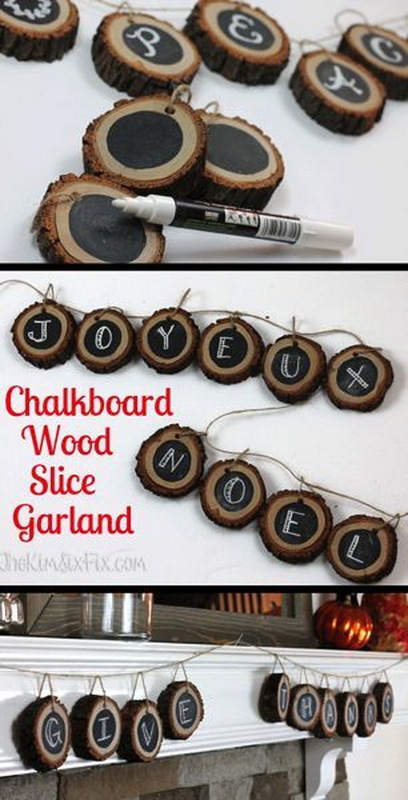 Paint a piece of wood in distressed white and write your autumn season greeting. 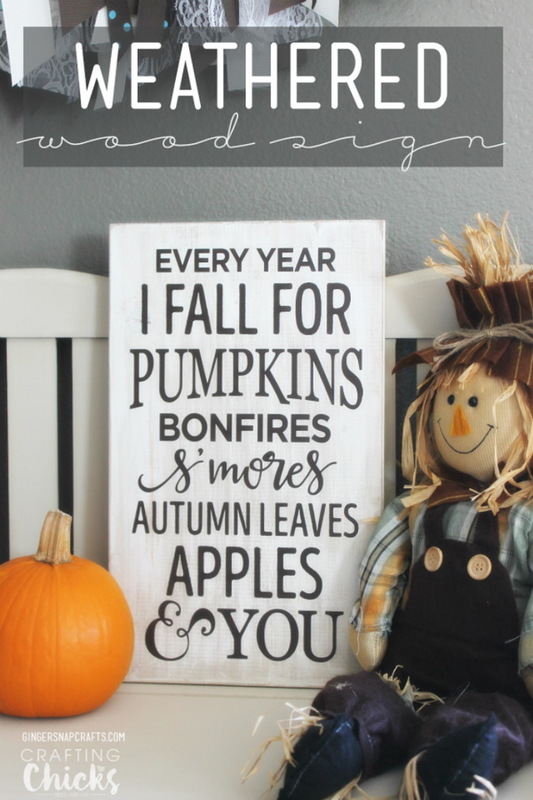 Arrange a few pumpkins and small scarecrow on its side and you’ve got your welcome sign to display on your mantle. See instructions via source. 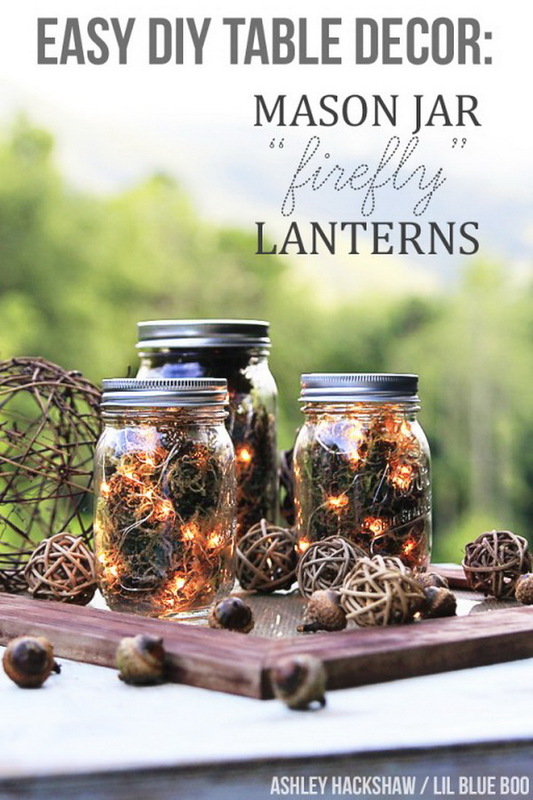 Use dried moss, acorns, and string lights to craft these rustic lanterns, perfect for cool evenings spent outside during this fall season. DIY instructions via lil blue boo. 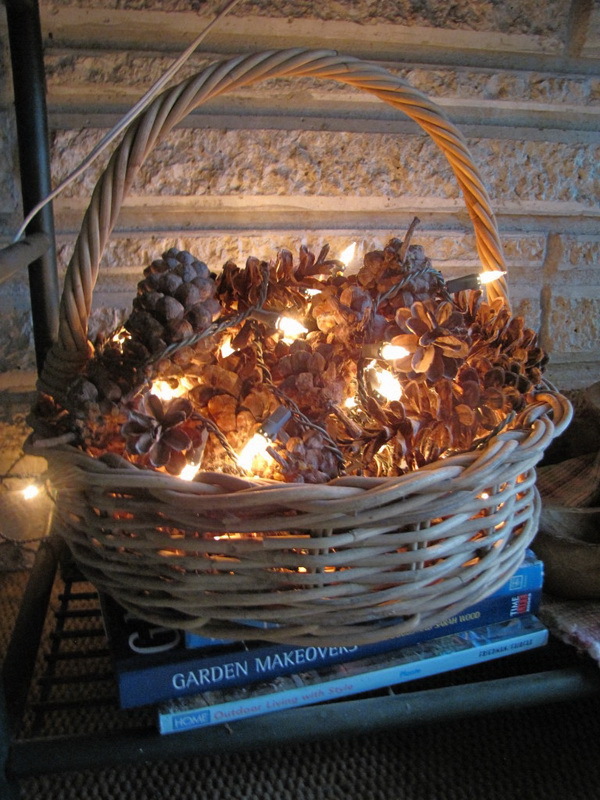 Nestle string lights between pinecones in a basket! 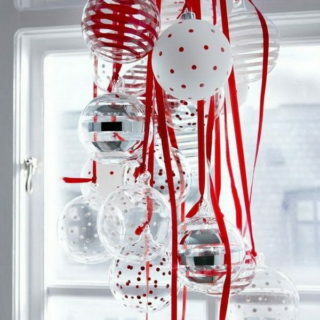 One of the simpliest idea for rustic fall or Christmas decoration. See more details via homesthetics. Create these beautifully rustic candle holders for your fall home decor ! All you need is an empty jar & sticks from your yard. Glue those small twigs, small branche to glass or plastic candle holders. 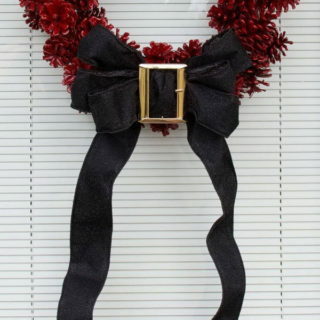 Once you have them all in place and secured with hot glue, tie a burlap or satin bow around to really make them special. DIY instructions via lm lifestyle design. Add a touch of rustic elegance to your decor with a faux cotton branch centerpiece. See the DIY instructions via ehow. Whether bundle these cotton branches up in a tall vase or arrange them into a wreath. This will surely add a touch of rustic elegance to your decor. DIY instructions via prodigal pieces. 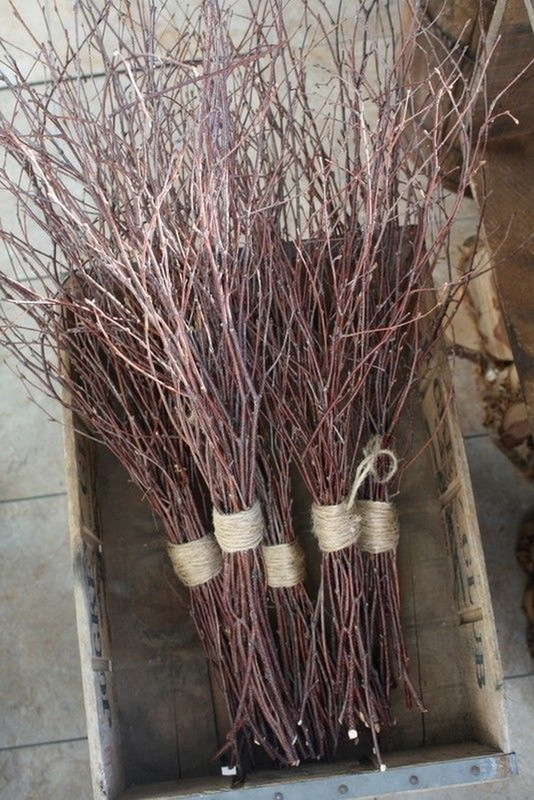 These auburn branches will make pretty centerpieces for any fall home decor. via memoirs of a happy heart. 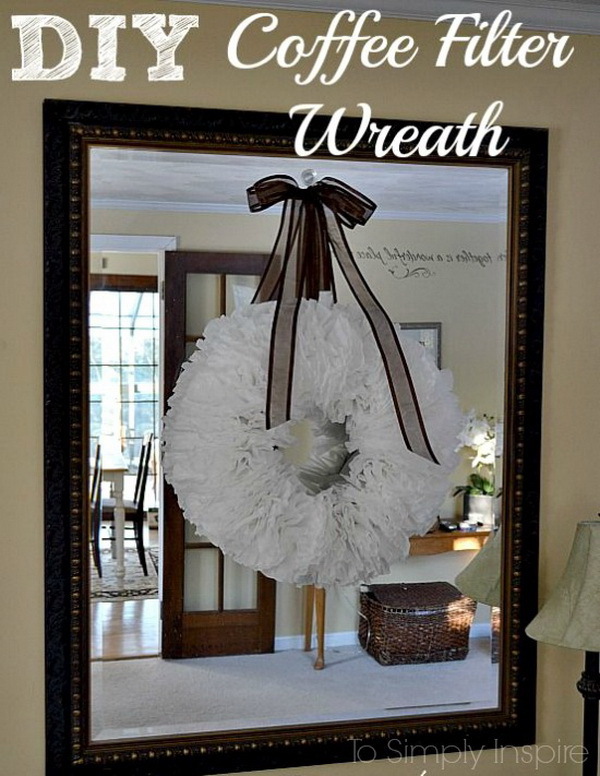 Create a beautiful wreath with small pieces of burlap for the front door or inside your home decor. It must bring a bit of rustic charm and elegance to your home décor. DIY instructions via live laugh rowe. 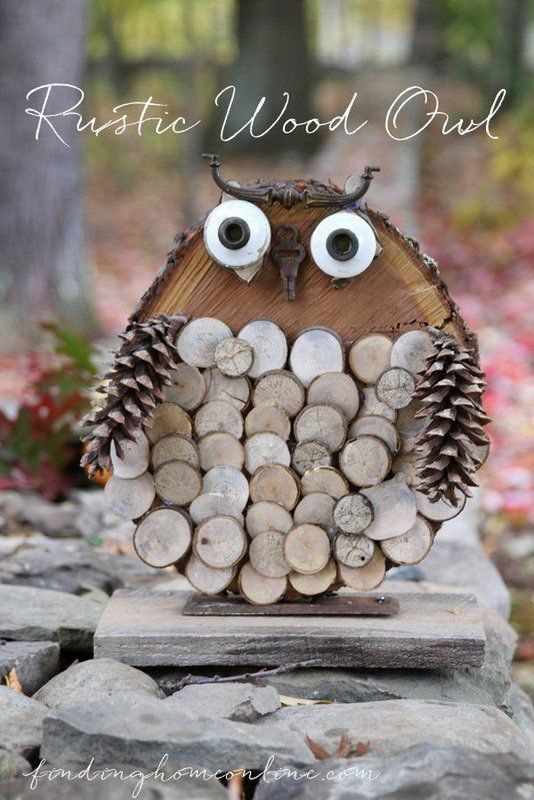 Use a big wood slice to make your super cute owl charm together with some small wood slices and pinecones. Lean it on your door or bookshelf for a super cute own decor. 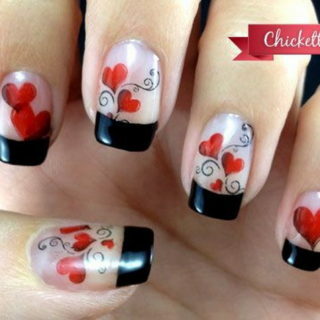 See the DIY tutorial via infarrantly creative. Tired of the natural look of pinecones in your decor? Try to bleach your pinecones for an unusual beautiful effect in home decor. See DIY instructiosns via sand and sisal. Create a DIY Acorn Photo Frame with that plethora of acorns in the yard. It makes great home decor piece or used as gifts with a fall family photo. DIY instructions via an extraordinary day. 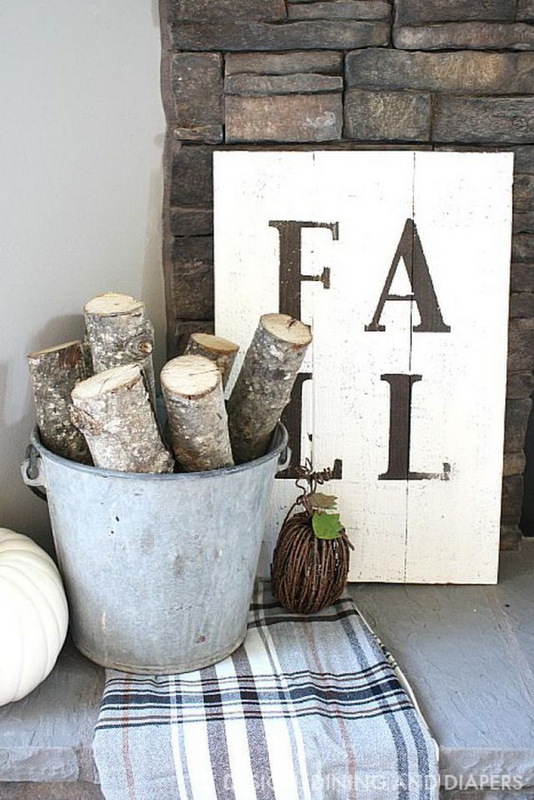 Create a completely customizable wood slice banner or garland with slices of tree branch and chalkboard paint, perfect for that rustic and natural look for your fall home decor. Tutorial via the kim six fix. A quick and easy burlap wreath for the inside or outside decor for fall. It exudes a typical Fall feel. You can do it in just 15 minutes! DIY instructiosn via diy ready. Make this easy leaf garland and add it to your fall decor. See the tutorial via craf berry bush. 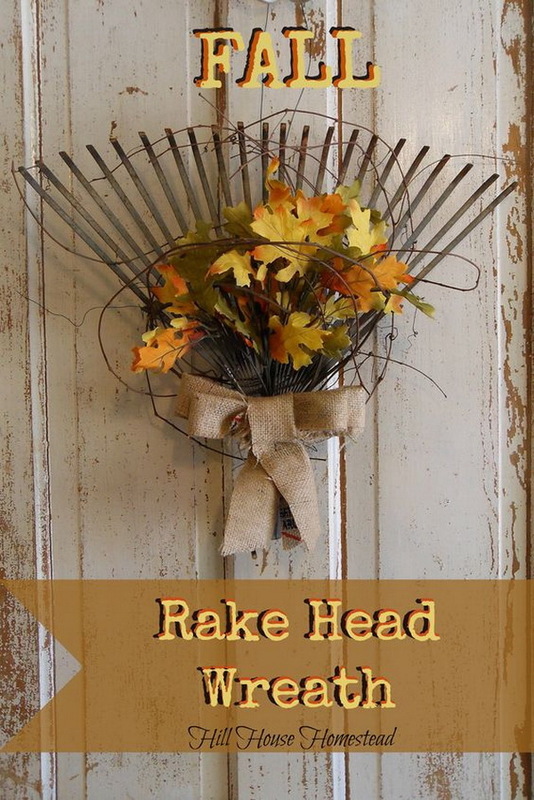 Repurpose an old rake head as a rustic alternative for a traditional wreath by adding a burlap sack bow and faux leaves. DIY instructions via hill house home stead. 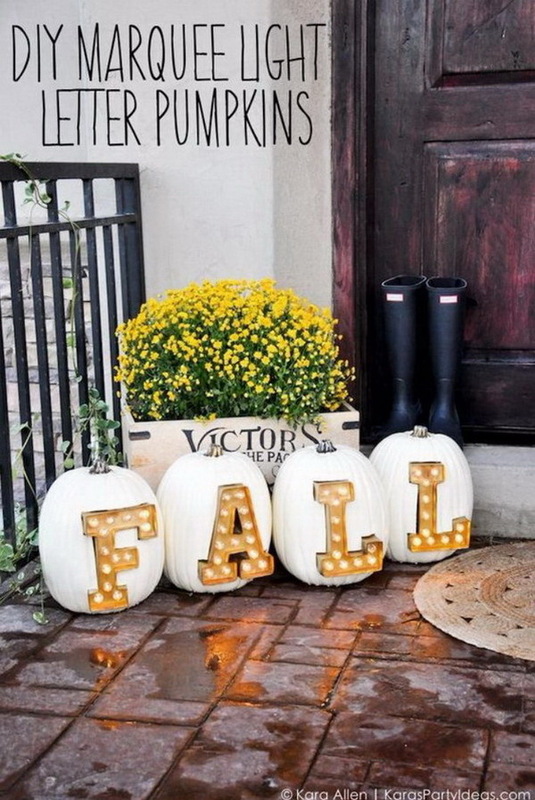 Carve the pumpkins and decorate with big bold Marquee light letters. Looks perfect for your front porch to display and create a touch of country charm and an inviting atmosphere! DIY instructions via kara sparty ideas. Carve out the center of tree stumps big enough and place a candle inside, and light them up for a whimsical decor for this fall. DIY instructions via cozy stylish chic. Thank you The clock is from World Market!! They are all super cool and amazing. You rock really. Thank you for sharing.